Election Day has almost arrived. San Diego voters will soon weigh in on the future of Mission Valley and a potentially game-changing approach to county elections, among other measures, and choose new state and local leaders, including county supervisors and City Council members. If you still need to cram before Tuesday’s election, we’ve got your back. Here’s a guide to the races and issues we’ve covered. This year’s general election ballot includes 12 ballot measures (but, strangely, only 11 you’ll actually vote on) on everything from rent control to daylight savings time, plus lots of bonds. Listen to Sara Libby and Ry Rivard’s podcast rundown of each measure to get up to speed. 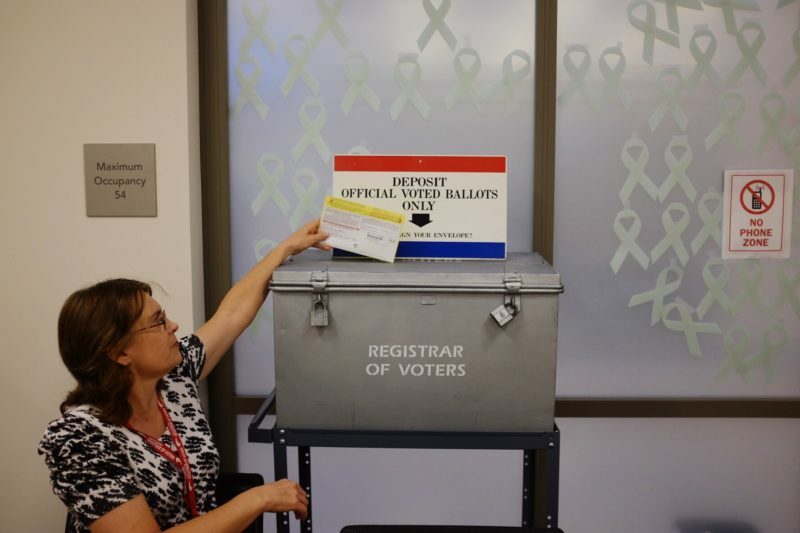 Meanwhile, our friends at CALmatters have done incredible work explaining and dissecting the state ballot measures, as well as the statewide races for positions like governor, state superintendent and others. Check out their 2018 election guide here. There are four countywide measures on the ballot this year. The first three focus on setting county policies when it comes to pension funding and elections. They have faced some opposition but haven’t gotten much air time. Measure D, on the other hand, calls for a major shift to county elections and has drawn a lot more attention from political insiders. This ballot measure, pushed by state Assemblyman Todd Gloria and other progressives, would force county candidates to run in general elections rather than allow candidates to win outright in the primary, when fewer people vote. A judge ultimately decided this measure should be on the November ballot after a partisan standoff that ended up in court. 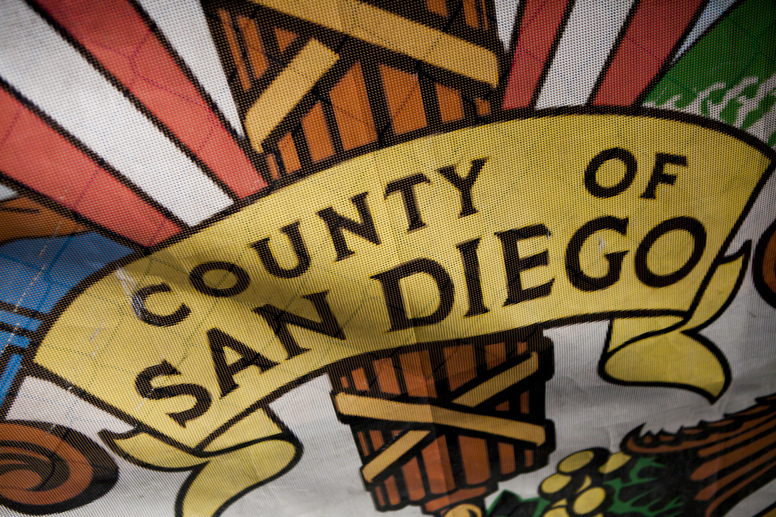 The city of San Diego instituted a similar reform in 2016. You can check out our local ballot measure guide to get more details on all of these measures. City voters will get a crack at eight ballot measures. We covered all eight in the local ballot measure guide. Among them: Measure H, which would usher in term limits for school board members, has gotten more buzz for what it doesn’t do – many had hoped that reforms to school board elections would include a switch to subdistrict-only races. Right now, school board members run in a specific subdistrict during the primary, then in a costly citywide election during the general election. Measure L would grant raises to the city’s elected leaders and put the kibosh on controversial car allowances. 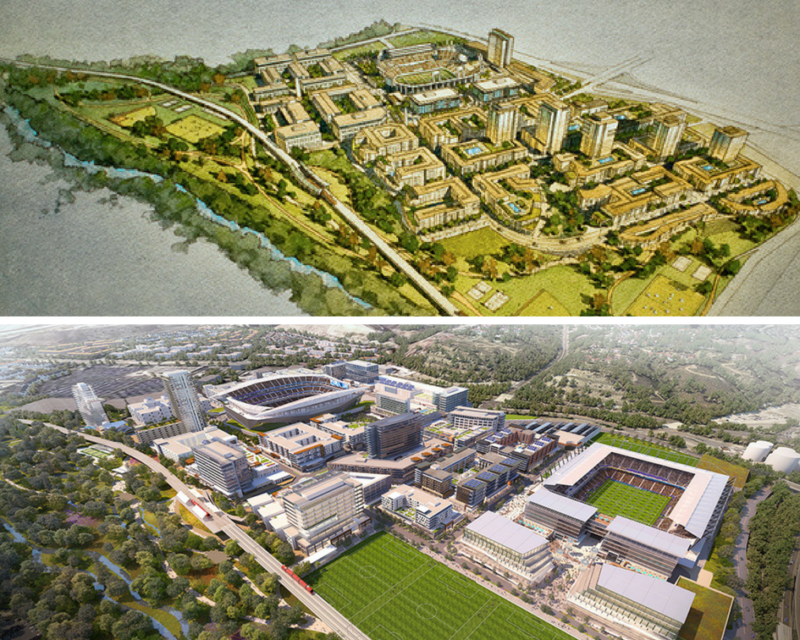 Top: SDSU’s vision for the Qualcomm Stadium site in Mission Valley. Bottom: SoccerCity’s vision for the site. The two citywide measures that have inspired the most debate have major ramifications for Mission Valley. Voters have a chance to dictate future developments on the expansive plot that houses the stadium formerly known as Qualcomm with Measures E and G.
Measure E is the SoccerCity plan. La Jolla-based FS Investors is asking voters to force the city to lease the land — along with the Murphy Canyon site of the former Chargers headquarters — to it so it can build an urban district centered on a Major League Soccer expansion team. Measure G is the SDSU West plan, which would require the city to sell much of the Mission Valley property to San Diego State so it can build some amount of student housing, academic buildings, a river park, offices, retail, a hotel and housing. FS Investors and SDSU boosters were once partners, working closely in 2016 to reach a joint solution to bring Major League Soccer to town and secure SDSU football’s future. That partnership fell apart last year, just as the public learned of SoccerCity. Scott Lewis went behind the scenes with the players from both sides to figure out how it went wrong. Both the SoccerCity and SDSU West plan promise a river park that’s long been envisioned along the San Diego River through Mission Valley. But neither plan can guarantee that park will finally get built. Many of the most enticing commitments in the SoccerCity plan (Measure E) are contained in a letter SoccerCity’s developers sent the mayor last year. It’s not clear that those are binding promises, according to a handful of municipal attorneys. City Attorney Mara Elliott says they are not. On the other hand, if voters approve Measure G, it won’t do much more than grant SDSU the option of buying the land. But SDSU has sketched out what it plans to do if it eventually acquires the land – whether that happens through Measure G or by some other process should both measures fail. Ry Rivard found that the university can’t explain how it would pay for the improvements it’s envisioned as part of that plan. If you’re looking to get into the weeds of both plans – and where they diverge – here’s a video of the SoccerCity-SDSU West debate we hosted at Politifest. Republican County Supervisor Ron Roberts has for more than two decades represented the district that covers a large swath of the city. Now he’s termed out, and the race to replace him is seen as the first in a series of races that could loosen Republicans’ grip on the board – right now it’s represented entirely by the GOP. Former Assemblyman Nathan Fletcher, a Republican-turned-Democrat who has methodically built progressive support, and former District Attorney Bonnie Dumanis, a Republican, are now vying to replace Roberts. Democrats, labor leaders and advocates have for years criticized the county for building up its reserve accounts and for not spending enough on social services. They see this race as their first shot to begin pushing a more left-leaning agenda before other long-sitting supervisors are termed out in 2020. But both candidates have said they’d like to see the county bolster spending on homelessness and mental-health services and describe themselves as change agents. Four of the city’s nine City Council seats are on the ballot and if Democrats are victorious in at least one key race, they could gain more power to drive policy change in the city. Mayor Kevin Faulconer currently has the power to veto progressive policies pushed by City Council Democrats. But that could change. City Council Democrats could seize a veto-proof majority if they eke out a win in Districts 2 or 6, and insiders consider District 2 the seat with a better chance of flipping parties. Jennifer Campbell, a Democrat, hopes to oust incumbent Republican Lorie Zapf. Their party politics differ but Campbell and Zapf are largely on the same page when it comes to the most contentious local issues facing the district that spans from Bay Ho and Pacific Beach to Point Loma. In their quest to oust Zapf, Democrats have highlighted national issues to try to pave the way for Campbell. City Council President Myrtle Cole is facing a serious challenger in fellow Democrat Monica Montgomery, who once worked in Cole’s office. 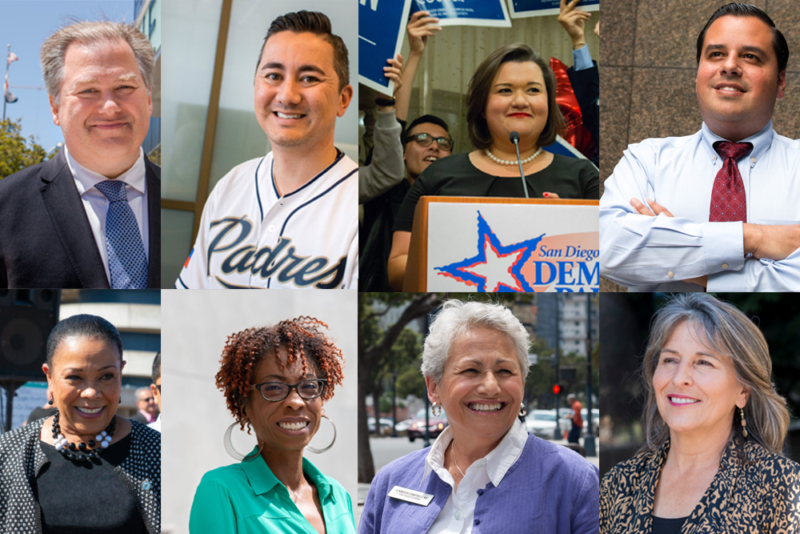 Montgomery shocked political insiders outside the southeastern San Diego district when she bested Cole in the June primary, though union and party officials have since come to Cole’s aid to try to help the incumbent hold onto her seat. Former 91x DJ Tommy Hough, a Democrat, has racked up powerful party endorsements in his bid to replace Republican Councilman Chris Cate in the district that includes Mira Mesa, Kearny Mesa and Sorrento Valley. Cate, who is on a short list of potential 2020 mayoral candidates in his party, last year was caught in a scandal when he leaked the city attorney’s legal analysis of the SoccerCity initiative to a lobbyist working for the investor group behind the measure. City Councilman David Alvarez, who represents Barrio Logan, Sherman Heights, San Ysidro and Otay Mesa, is termed out, making this the only open seat this fall. Alvarez staffer Vivian Moreno and San Ysidro school board member Antonio Martinez – both Democrats – are vying to replace him. Moreno and Martinez largely agree on policy issues but diverge on vacation rental regulations and rent control. The battle between them has become a proxy fight for long-running divides in South Bay politics. The school district wants to increase property taxes by $60 per $100,000 of assessed home value for 39 years to support a $3.5 billion bond that could end up costing voters nearly $7.5 billion overall. The proposed bond would be the district’s third in the last decade, and the district technically has more than $2 billion in remaining bond money from its two previous bonds it can access. The district says this bond would help it improve school security, upgrade classrooms, repair plumbing and remove lead and asbestos – familiar asks for voters who approved almost identical spending in past bonds. Indeed, Ashly McGlone found most of the schools the district flagged for unsafe levels of lead in the water the past couple years haven’t received the upgrades promised in previous bond measures. One of the major arguments for the bond is that it would help the district address lead in the water at its schools, though less than 2 percent of bond dollars are set to flow to those fixes. Longtime Republican Rep. Darrell Issa made major headlines early this year when he announced he’d retire at the end of his term. Republicans scrambled to regroup to try to hold onto one of the party’s most vulnerable seats in the nation. Board of Equalization member Diane Harkey, a Republican, and environmental attorney Mike Levin, a Democrat, eventually emerged victorious after a crowded primary race to represent a coastal district that stretches from San Diego’s North County to southern Orange County. Issa has endorsed Harkey and said he recruited her to run. Levin has said his priorities, if elected, would be environmental protection, health care and infrastructure; Harkey says she’s most focused on jobs and maintaining crucial National Institutes of Health funding for the region’s biotech companies. Scandal has engulfed Republican Rep. Duncan Hunter, who now represents the congressional district that spans from Jamul to Temecula. Hunter and his wife Margaret were indicted in August on federal charges related to accusations that they misused more than $250,000 in campaign funds. Hunter’s facing Democratic challenger Ammar Campa-Najjar, whose bid against Hunter has drawn national attention, both because of Hunter’s legal challenges and because of his campaign attacks linking his Christian opponent to Muslim terrorism. Hunter has long been expected to hold on to his seat despite it all, though a new poll found that his lead in the race has shrunk in recent days. Hunter has made only limited, unannounced appearances since the indictment, saluting Trump and attacking Campa-Najjar. Campa-Najjar has said he’d prioritize infrastructure and jobs if elected. Assemblyman Brian Maienschein, a moderate Republican known for crossing the aisle, is facing a tight race against Democratic newcomer Sunday Gover. Andrew Keatts and Jesse Marx contributed.